Colonial Heritage in Williamsburg, Virginia, is a gated active adult community, which enjoys a beautiful setting that is steeped in history. 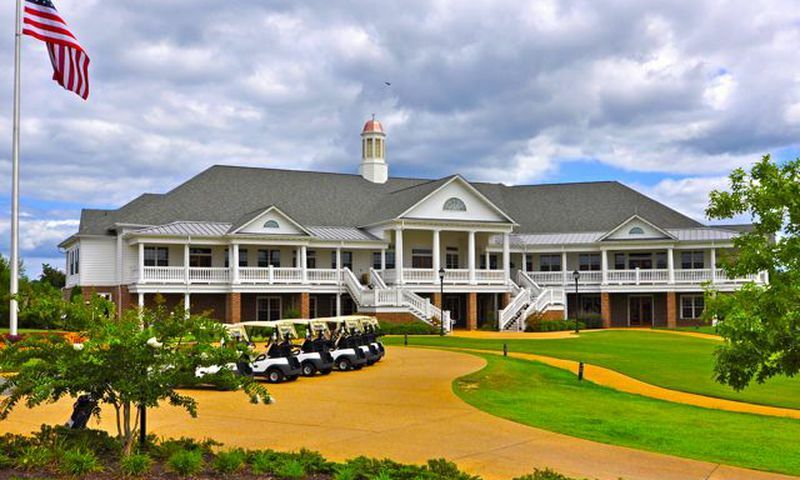 Residents, aged 55 and better, will appreciate Colonial Heritage's 18-hole championship golf course and spacious clubhouse, which feature amenities that will appeal to many active adults. This award-winning community has earned many accolades and is nestled just 50 miles east of Richmond. The active lifestyle at Colonial Heritage centers on the beautifully appointed community clubhouse and the 18-hole championship golf course. The 25,000 square-foot Heritage Club House features plenty of amenities, including a 7,500 square-foot fitness center, indoor swimming pool, hobby and game rooms, a woodworking shop, meeting rooms and a veranda that overlooks the beautiful golf course. The clubhouse also offers fine dining at the Heritage Dining Room or casual dining at The Grille. Outdoors, residents can enjoy a swimming pool that is open seasonally, four tennis courts, two bocce ball courts, and the 18-hole championship Colonial Heritage Golf Club. This par-72 course, designed by Arthur Hills, spans 6,889 yards from its longest tees and showcases Virginia's natural beauty. Golf enthusiasts will also enjoy the convenience of an on-site pro shop. Lennar is the builder of Colonial Heritage and upon completion, the community is expected to contain approximately 1,800 homes. The homes at Colonial Heritage are available in both single-family and attached duplex homes. Single-family homes feature two to three bedrooms, two to three bathrooms, and a two-car garage. Each plan also includes a basement option. There are two models of attached duplex homes, each with two bedrooms, two bathrooms and a two-car garage. Colonial Heritage homes have distinctive exteriors, which include low-maintenance vinyl siding, 30-year architectural roof shingles, vinyl tilt-out Low-E windows, designer lampposts, and six-panel insulated front doors. Interior features include 9-foot ceilings throughout the main floor, ceiling fans, designer light fixtures, and home network multi-media packages. Prospective homeowners will also appreciate Colonial Heritage's gourmet kitchens and luxurious bathrooms. These beautiful kitchens are complete with features such as furniture grade cabinetry, Corian countertops, and high-quality GE appliances. The luxury bathrooms include tempered glass shower enclosures, ceramic flooring, and soaking tubs in the owner's bath. At Colonial Heritage, residents can enjoy a beautiful setting which includes high-quality, low-maintenance homes and plenty of community amenities. Golf, tennis, bocce ball, card games and woodworking are just a few of the hobbies available at the clubhouse. The activities schedule allows residents to make their social life as full as they wish while exploring both new, and long-held, interests. The community's historic setting makes it a great location for charming local excursions. In addition to coordinating on-site recreations, Colonial Heritage's full-time activities director is happy to help residents plan activities in Williamsburg and the surrounding areas. With its rich history and great location, Williamsburg is an ideal setting for this active adult community. History buffs will love visiting shops that stand open as they did 300 years ago, while still enjoying the modern day recreational attractions. The area surrounding Colonial Heritage offers great restaurants, shopping, outstanding health care facilities, educational opportunities and an international airport. Nearby Chesapeake Bay and two broad rivers are ideal for boating and fishing. Colonial Heritage residents can plan day trips to many exciting locations in the surrounding area. Just next door, Norfolk by the Sea is home to the Virginia Opera, McArthur Center and the Chrysler Museum of Art. The white sand shore of Virginia Beach is only an hour to the East, while Richmond, Virginia's state capital, is only 45 minutes to the west. Heritage Clubhouse - 25,000 Sq. Ft.
Atheltic Club - 7,500 Sq. Ft. There are plenty of activities available in Colonial Heritage. Here is a sample of some of the clubs, activities and classes offered here. The Cottages are offered as new construction. They feature living spaces between 1,366 and 1,936 square feet. Most homes in the Cottage Collection have two to three bedrooms, two to three bathrooms, and an attached two-car garage. The homes in the Garden Collection are now offered on a resale only basis. Homebuyers can select a home that ranges from 1,748 to 2,517 square feet in size. These homes have three bedrooms, two to three bathrooms, and an attached garage. All are single-family homes however, the Aldrich model is the only floor plan in this collection that has been built as both an attached duplex as well as detached single-family structure. Homebuyers can select a new construction model from the Manors Collection. These homes offer between 1,831 and 2,379 square feet of living space with two to three bedrooms, two to four bathrooms, and an attached two-car garage. The Executive collection is now offered on a resale only basis. Homebuyers can select a previously owned home from this collection that offers between 2,376 and 2383 square feet of living space. There were two floor plans that include three bedrooms, two to three bathrooms, and a two or three-car garage. The Plantations Collection offers the largest new construction homes. Homebuyers can select from four floor plans that have 2,218 to 2,825 square feet. Most homes have three bedrooms, two-and-a-half bathrooms, and an attached two-car garage. The community is laid out beautifully. Some small rolling hills and nice wooded areas too! The activities at the clubhouse are very nice. Love it! Colonial Heritage is a 10. I am still shocked by how nice the floorplans are. After you live in the same home for 25 years, and then you look at the models, you realize how outdated and inefficient your home actually is. The construction quality is superb, the amenities are resort-like, and the residents are the nicest. We love living here. Colonial Heritage is a great place to live. Lots to do. Great neighbors. Our 55 Places partner agent was wonderful. She is excellent at her job. She treats you as an individual and always calls you back. I would advise anyone looking for a home in our area to call her, you will be happy that you did. I have owned an investment property in Colonial Heritage since 2005, and could not be happier with this beautiful, 55+ gated community in Williamsburg. The amenities are superb, location is excellent -- and the customer service from the HOA is outstanding. This is a very active, social community -- perfect for singles or couples! Audreynell and I both really like living in Colonial Heritage. We moved here because of the indoor pool and the exercise classes. When we moved here, I could hardly walk because of injuries from military duty. These classes have allowed me to build up the muscles that had deterioted in my body from injuries. Now that my muscles have returned, I'm able to do almost anything that I did before. We also enjoy the restaurant and beautiful scenery throughout the development. It's nice being close to the interstate and between Richmond and Virginia Beach. There's plenty of water activities close by and tons of shopping. It's the best of many worlds. It doesn't get too cold or too hot and there's plenty of pleasant sight seeing areas close by. There's also many water activities and the water ways here connect to the Bay and the Ocean. What else could a person want? I have lived in CH for 5 years now. It is a GREAT place. We have golf, swimming, great fitness classes, dancing, parties, and clubs of every variety you can think of. We are a community of ACTIVE adults. The people here are very friendly and interesting. We come from all over the country. The HOA fee is high(as mentioned in another post) - but you get a lot for your money. Check out the financials for yourself with the community management. We are financially sound and I feel comfortable in my investment here. I've been working for Lennar selling homes in Colonial Heritage going on 5 years now. After working with so many wonderful folks and watching them live happily ever after I decided it was my turn! It's hard to beleive this May will be my two year anniversary....time flies when you're having fun. I don't know why the previous review was so negative...but this is a fabulous place to live. The restaurant at the clubhouse is very good. Our chef has won or taken 2nd place in every "Taste of Williamsburg" competition held since I've lived here. The ballroom was closed for some ceiling repairs, but the clubhouse was definitely not condemned. There are scads of wonderful activities, the people who live here are amazingly friendly, the travel club offers trips to explore the area and further afield like the upcoming trips to DC, Charleston, and Ireland in October. We enjoy the indoor and the outdoor pools, the fitness center and the dozens of classes offered. Our latest financial review stated that both the golf course and the dining operations were make ing more than budgeted...and are doing well! I invite anyone to come check this community out...it's a fabulous place to live! Living in Colonial Heritage is a dream come true. I've moved 12 times for my career with Campbell Sales Company and living in Williamsburg is hard to beat. The location and convenient proximity really work! I've played golf courses all over the country and I personally rate our course as one of the finest. A true Williamsburg gem and great community to live in. The selection of homes offered by Lennar, the lifestyle and the people living here make it a great place to live. 55places.com is not affiliated with the developer(s) or homeowners association of Colonial Heritage. The information you submit is distributed to a 55places.com Partner Agent, who is a licensed real estate agent. The information regarding Colonial Heritage has not been verified or approved by the developer or homeowners association. Please verify all information prior to purchasing. 55places.com is not responsible for any errors regarding the information displayed on this website.